Steam Hits a Concurrent User High: Is the PC Taking Over? On January 2, 2015, something happened that surely made Valve CEO Gabe Newell proud. The world conquering Steam service had reached a new record number of concurrent users, actually more than 8.5 million (you can check the Steam stats here). For those who have been living on a desert island for the last decade or so, Steam is digital distribution service that sells video games and software (mostly PC versions). And the fact that Steam hit that record is surely good news for PC gaming and a blow to those naysayers who claimed that “PC gaming is dead”. 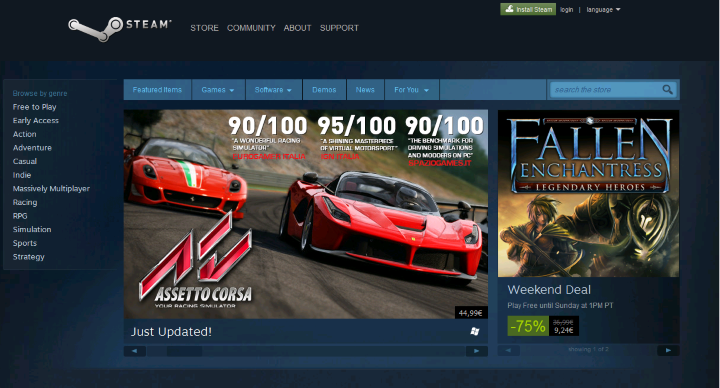 Actually PC gaming appears to be alive and well, but one must bear in mind that the number of users on Steam tends to be high during the winter sale – after all people are hunting for bargains and checking those deals daily, even though the Steam sales are not all they are cracked up to be, overall. Also with more free time during the Christmas holidays people are more likely to give games on their Steam list a spin. This is great news for PC gamers, and it follows an equally encouraging PC Gamer news article that reported that digital sales of video games rose almost 20 percent in the UK in 2014, being worth a massive 1.5 billion pounds. So will the PC take over the video games industry any time soon? Not straightaway, it won’t. Consoles still have the upper hand when it comes to simplicity and usability. After all, all you have to do when you get a console game is pop the disc in the drive, install and play. When it comes to PC gaming, you may need to know what DirectX, OS issues and video drivers are so the experience might not be as pleasant. Also, another console advantage is the unity of the platform – PCs have to be upgraded, so if you can’t tell the difference between a Nvidia GTX 970 and an AMD Radeon R9 graphics card then maybe the PC is not for you. And Valve’s idea of bringing the PC to the living room with Steam Machines appears to be going nowhere. But still, PC gaming is worthwhile for those with the time (and money) to invest in it, and some great PC exclusives such as the RPG Divinity: Original Sin and The Vanishing of Ethan Carter, which was amongst last year’s best games, were released in 2014. Also multiplayer online games such as DOTA 2, which happens to be the most popular game on Steam, and Counter-Strike: Global Offensive are some of the best gaming experiences you can enjoy. And a PC version of GTA V will be released in January, boasting a first person mode and it will be open to mods, that is, user modifications which will surely make the PC version the best one overall. In the end though, the increasing number of Steam users is a good thing for PC gaming and the video game industry overall, especially considering how Steam gives small developers a chance to showcase their games and also lets PC gamers get the latest AAA games at discount prices during the sales. As for the PC becoming the top video gaming platform, it seems it’s not there yet, although it’s taking bold steps in that direction.